[prMac.com] RAGE Software announced today the immediate availability of RAGE Domainer 1.1, a free update to the domain tracking and monitoring application for Mac OS X. RAGE Domainer allows web site owners to centralize domain details, as well as those of their competitors, with one easy to use application. This free update includes support for additional top-level-domains, fixes issues when importing domains from third party sources and adds full Leopard support. 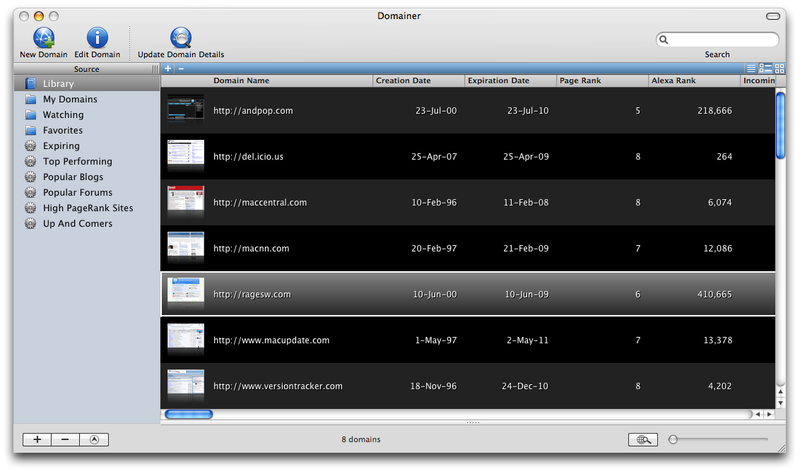 RAGE Domainer is the only web developer's tool for the Mac that helps domain owners easily gauge the value of domains in addition to tracking all whois information automatically. RAGE Domainer syncs with iCal and the Mac OS X keychain to notify owners of domain expiration details and to securely store FTP login details. RAGE Domainer requires Mac OS X 10.4 or later. A free trial version is available for download from RAGE Software. The full version of RAGE Domainer which allows tracking of an unlimited number of domains can be purchased for $39.95 USD safely and securely from the RAGE Software Store. Since 1999, RAGE Software has continued to deliver unique and useful software for Mac web developers including RAGE WebDesign, the first fully expandable HTML editor for the Mac, and RAGE Google Sitemap Automator, helping web site owners get listed in all major search engines.